I can’t believe these adults couldn’t answer any of these questions. …they do walk among us. 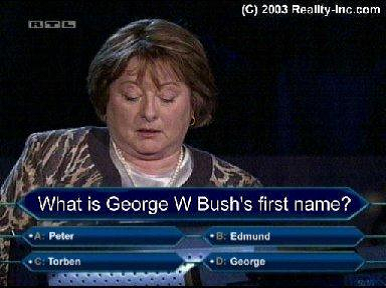 After being introduced to the show’s host Meredith Vieira, Evans was posed with a typically easy initial $100 question. 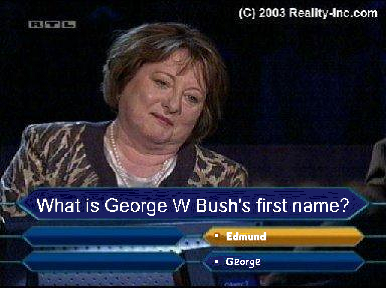 Immediately Mrs. Evans was struck with an all-consuming panic as she did not readily know the answer. ‘Hmm, oh boy, that’s a toughie,’ said Evans, as Vieira did her level best to hide her disbelief. ‘I mean, I’m sure I’ve heard of some of these things before, but I have no idea how large they would be. ‘Evans made the decision to use the first of her three lifelines, the 50/50. Mrs. Evans asked to be connected with her friend Betsy, who is an office assistant. ‘Hi Betsy! How are you? This is Kathy! I’m on TV!’ said Evans, wasting the first seven seconds of her call. ‘Ok, I got an important question. Which of the following is the largest? 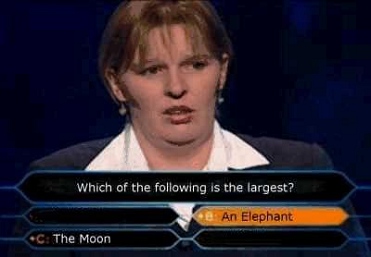 Betsy quickly replied that the answer was C, the moon. Evans proceeded to argue with her friend for the remaining ten seconds. ‘Betsy, are you sure?’ said Evans. ‘How sure are you? Duh, that can’t be it. ‘To everyone’s astonishment, the moronic Evans declined to take her friend’s advice. ‘I just don’t know if I can trust Betsy. She’s not all that bright. So I think I’d like to ask the audience,’ said Evans. ‘Wow, seems like everybody is against what I’m thinking,’ said the too-stupid-to-live Evans. ‘But you know, sometimes you just got to go with your gut. This one is equally unbelievable. They Drive, they breed, they vote.